What’s New in 3 Series MkII? Since their release, word has spread on the quality and value found in the original JBL 3 Series, resulting in wide adoption from hobbyists to high-end professionals working in music, film, post, and broadcast production worldwide. With such an obvious hit, you might ask, "Why update now?" 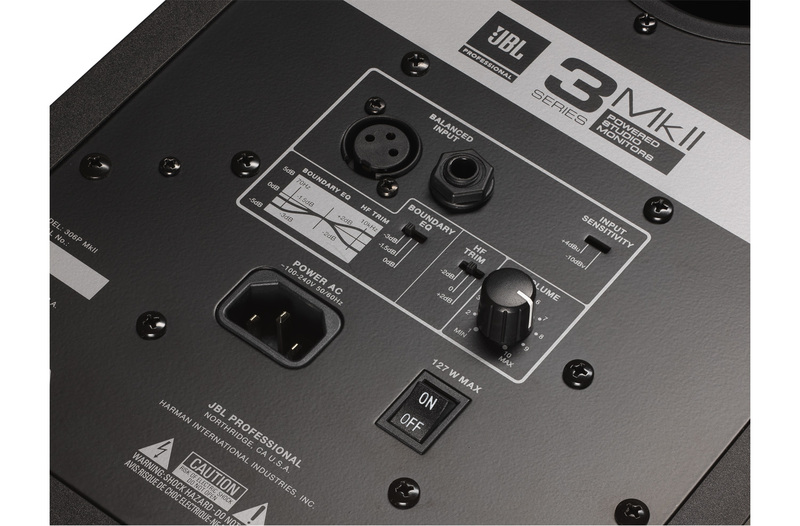 On every JBL project, there’s always a handful of features or improvements that the engineering team can’t squeeze in before going to production, and 3 Series was no different. When the opportunity presented itself, we decided to make those final improvements to the transducers, add a frequently-requested feature, and apply the latest manufacturing learnings. The result—new editions of these popular studio monitors that retain the best qualities of the originals, but now look better, sound better, and provide transparent sound in even more production environments. Reveal impressive detail, ambience and depth in your mixes thanks to the groundbreaking JBL Image Control Waveguide. Originally developed for our flagship M2 Master Reference Monitor, this patented innovation ensures an acoustically seamless transition between the low- and high-frequency transducers and provides an immersive soundstage with precise imaging. Offering a broad sweet spot and neutral frequency response, 3 Series monitors deliver a crystal-clear representation of your mix—revealing subtle details, even when listening off-axis. To help you make the best mix decisions, we equipped all the monitors in this series with acclaimed 3 Series transducers that now perform even better. Hear deep, accurate and tightly controlled bass thanks to a long-throw woofer and the patented JBL Slip Stream™ low-frequency port. Enjoy soaring, immaculately detailed highs via the woven-composite 1" Neodymium tweeter. JBL engineers took things to the next level with faster HF transient response through fine-tuned ferrofluid damping, and greater low-frequency linearity and lower harmonic distortion, courtesy of an enhanced woofer design. The result is a studio monitor you can trust—with unmatched peak handling, stunning dynamics and neutral frequency response that’s unbeatable in its class. 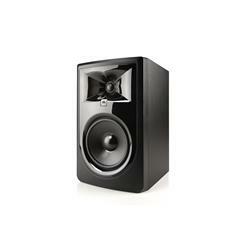 JBL 3 Series monitors are ready for the most demanding production styles right out of the box. Dual integrated Class D power amplifiers, which we custom designed for each transducer, give you generous dynamic range for any project. From music production and podcasting to cinematic sound design or daily vlogging, enjoy the output and power you need to hear exceptional detail at any volume-even at peak SPLs. Simply plug in, power on, and start creating. The dimensions and acoustics of a room can have a major effect on sonic accuracy, and that’s why the JBL 3 Series family lets you adjust the response to fit your studio. The new Boundary EQ attenuates the low-end boost that can occur when you place monitors directly on the desktop or near walls. The 3-position HF Trim switch allows you to adjust the high-frequency response of the monitors to tailor them to room acoustics or personal tastes. Offering both balanced XLR and 1/4" TRS inputs, and adjustable +4dBu/-10dBV input sensitivity, monitors in the 3 Series family offer flexible, professional connectivity options that provide easy setup while maintaining your signal integrity. The 3 Series family design leverages over 70 years of JBL acoustic expertise to create refined studio monitors that deliver outstanding value. While other manufacturers use off-the-shelf components, and make subjective decisions about the sound, we build speakers that squeeze every ounce of performance from each component to deliver efficient, accurate sound reproduction. Monitors in the 3 Series are designed to the JBL Linear Spatial Reference criteria—a series of 72 individual measurements taken 360 degrees around each speaker to ensure a faithful reproduction of your mix, whatever your listening environment. JBL Professional studio monitors are designed for reliable performance, even when projects push your gear to the limit. Before being approved for production, 3 Series monitors must first pass our strenuous JBL Power Test. Each model is required to perform flawlessly at maximum volume for an unheard-of 100 hours—without failure. As a result, you can depend on 3 Series monitors to deliver consistently excellent sound reproduction for years to come. 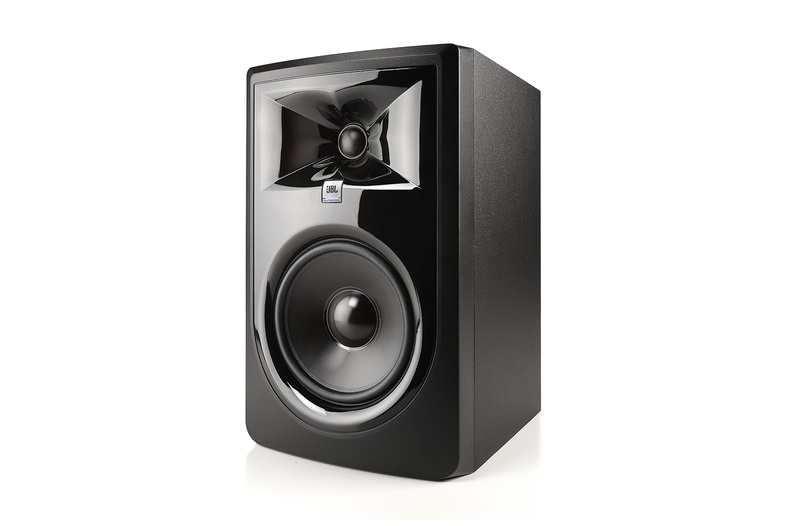 The optional LSR310S subwoofer allows you to extend the bass response of the 3 Series monitors even further. It incorporates the patented JBL Slip Stream™ Port, which works in concert with a custom 10" down-firing driver and a 200 Watt amplifier to add deep, powerful bass to any studio monitor system. The XLF Extended Low Frequency Setting, a JBL first, activates a specially-engineered tuning that emulates the ample bass tuning used in today's dance clubs. The LSR310S offers plenty of other professional features including balanced inputs and outputs, selectable input sensitivity, and a choice of three crossover settings. With three different models to choose from, there’s a 3 Series monitor to fit your studio and budget. The 5" 305P MkII offers a remarkably full sound in an enclosure small enough to fit in the tightest workspace. The 6.5" 306P MkII is perfect if you need even more volume and bass response while still maintaining a compact footprint. The 8" 308P MkII is the largest and most powerful of the three models in the series, offering impressive low end, high output and excellent dynamic range.